The European Space Agency has shared an incredible image from deep inside the Milky Way’s abundance of clouds, showing the fascinating formation of new stars. Blue in the image https://t.co/pHKTnXOqvP indicates warm dust being heated by protostars. 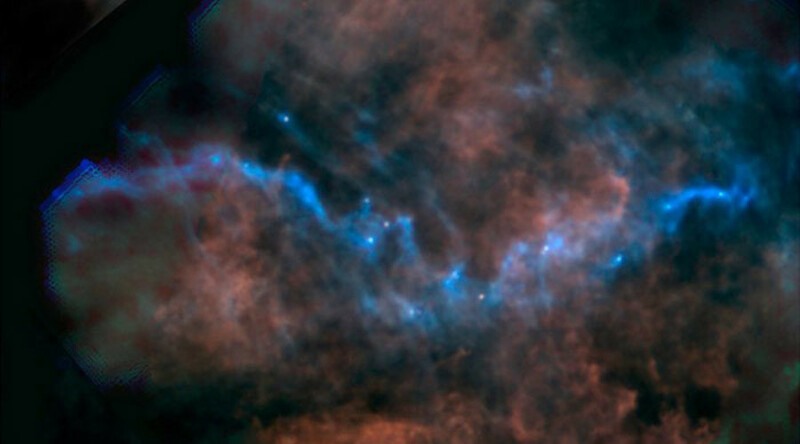 The blue ribbon of future stars were captured among clouds of dust in one of the coldest areas of the Milky Way, “perhaps 10-20 degrees above absolute zero.” Astronomers focus on these cold spots so they can catch the soon-to-be stars before they ignite and form. The blue wave represents the coldest parts of the cloud at -259 degrees Celsius and contains 800 times as much mass as the sun. The warmer regions of the cloud are color-coded in red. For perspective, this new image actually spans over an area twice the width of the moon. This is just one of 116 areas within the Milky Way that Herschel observes as part of the Galactic Cold Cores project. Herschel has captured many mesmerizing pictures of the universe since its launch in 2009, giving scientists crucial – and rare – insights into our galaxy.